1 Put the purple sweet potato in a pan of boiling hot water and then put the green banana and breadfruit in another pan of boiling hot water (if you were to boil the purple sweet potato with the green banana and breadfruit it would turn purple). Bring to the boil and then turn down to a medium heat. 2 Heat a wok on a medium heat, then put in the coconut oil. When the oil has melted add the shallots, spring onion, and the green and orange pepper and stir. 3 After about a minute add the garlic, scotch bonnet pepper the rock salt and cracked black pepper, stir and cook for another minute. 4 Then add the thyme and stir and cook for another 2 minutes. 5 Add the ackee, gently fold into the rest of the ingredients making sure you do not mash up the ackee and place the lid on and cook for 5 minutes on a low heat. Occasionally gently stirring and checking it has not dried out, if needed add a table spoon of water. 6 When you can get your fork to into the Purple sweet potato, green banana and breadfruit it is cooked. Then remove from the heat. 7 Once the ackee has heated though remove from the heat. 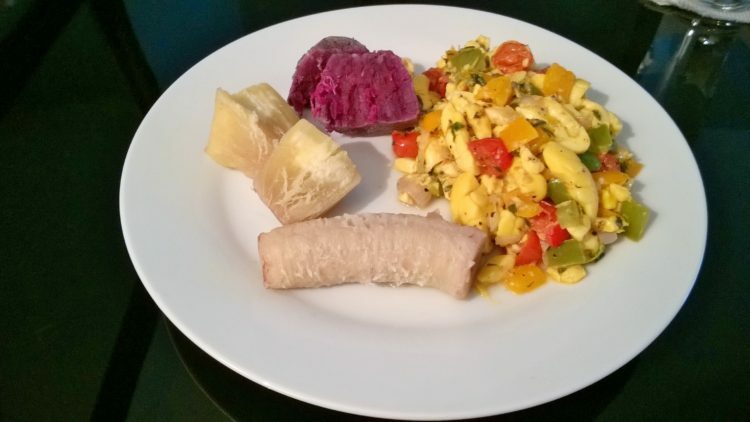 8 Plate up the purple sweet potato, green banana, breadfruit, ackee and serve. Enjoy!